Colombian President Juan Manuel Santos has awarded the Nobel Peace Prize for his role in the peace process with Revolutionary Armed Forces of Colombia (FARC) rebels. He dedicated the prize to the victims of his country's civil war. He was selected for the prestigious award by the Norwegian Nobel Committee. He is second Colombian to win Nobel Prize after writer Gabriel Gracia Marquez who had won the literature Prize in 1982. 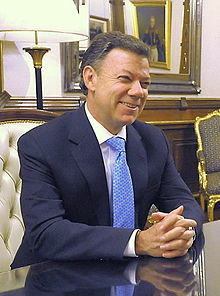 Santos is also second Latin American to receive Nobel Peace Prize after Guatemala’s Rigoberta Menchu had won it in 1992.